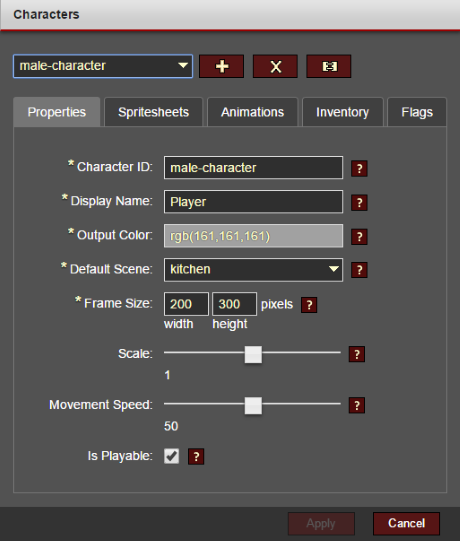 This tab sets the character's properties such as ID, display name, and default scene. Note that a character is always "anchored" to a scene; if you want a character to appear in a certain scene, set its Default Scene accordingly. It's also important to set the correct Frame Size. See Character Spritesheets and Animation for more details. This tab sets the spritesheet(s) which apply to this character. Spritesheets are uploaded to the Asset Library. Important: For performance reasons, it is highly recommended that you use a single spritesheet for the common animations like idle, walk, and talk, while rare "one-off" animations can be put in another spritesheet if needed. This reduces the likelihood of flicker and/or artifacts while spritesheets are swapped in real time. This tab sets the items that are in the character's inventory by default. This tab sets the flags that are assigned to the character by default.